A Textbook of Bacteriology, Fourth Edition provides information pertinent to the medical aspects of bacteriology. This book presents the importance of sulfonamide compounds in the treatment of many bacterial diseases. 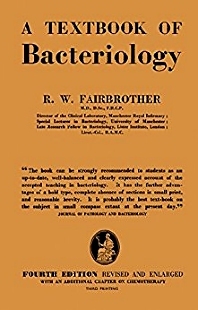 Organized into three parts encompassing 38 chapters, this edition begins with an overview of the salient features of the development of bacteriology. This text then explores the food requirements of the bacteria as well as the elements necessary for the synthesis of the bacterial protoplasm. Other chapters consider the numerous and complex factors involved in the reproduction of bacteria. This book discusses as well the presence of antitoxins in the serum of an individual, which is an indication of increased resistance to infection with the homologous organism. The final chapter deals with serological reactions that are most widely used, namely, agglutination, precipitation, and complement-fixation. This book is a valuable resource for medical students, physicists, bacteriologists, chemists, biochemists, and research workers.